Faculty, residents and students of the Northern Ontario School of Medicine (NOSM) play an integral role in achieving the School’s mission of “Innovative education and research for a healthier North.” NOSM recognizes the contributions that all NOSM members are making to education, research, clinical care, and administration in Northern Ontario. The NOSM strategic plan calls for the School to foster excellent faculty relations, while more clearly articulating how contributions in the areas of education, research, clinical care, and administration enrich faculty members’ careers as clinical and non-clinical academicians. The strategic plan also promotes an environment that will enhance the quality of education, increase research output; increase grant funding; align research initiatives with NOSM’s mission and values; encourage an increasing number of NOSM faculty and learners to incorporate research, teaching, and other scholarly pursuits into daily activities; and encourage research collaboration across programs and divisions. The Faculty Affairs and CEPD Portfolio strives to support faculty to contribute to an academic endeavor in a variety of ways which will enhance their careers and result in achieving the goal of “Innovative education and research for a healthier North”. As one means to achieve this goal, the Faculty Affairs Unit at NOSM will award Faculty Peer Awards of Excellence annually to individuals with faculty appointments within the Clinical, Medical and Human Sciences Divisions. The purpose of these awards is to foster excellent faculty relations and to recognize the unique contributions of faculty members. Two (2) of the awards may be given to members of the Clinical Sciences Division, one (1) of the awards may be given to a member of the Medical or Human Sciences Division and two (2) of the awards may be given to members of the Clinical, Human, or Medical Sciences Divisions. 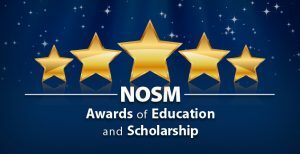 Recognizing that teaching is a core competency for all learners and that teaching excellence is a lifelong journey, Faculty Affairs, Learner Affairs, Undergraduate Medical Education, Postgraduate Medical Education, and Health Sciences units will collaborate to recognize teaching excellence among NOSM learners. Nominees for these awards will include residents, medical students, dietetics students, and physician assistant students. Award recipients will be publicly acknowledged at Northern Constellations, a faculty development conference jointly provided by the Faculty Affairs and the Continuing Education and Professional Development (CEPD) Offices. Award recipients’ names will also be published in the biweekly resident bulletin The Script, and the weekly NOSM newsletter, The NOSM Pulse. For more information, please read the 2018 Faculty Awards of Education Information Package or contact Julie Neill, Administrative Assistant for Faculty Affairs and CEPD. The deadline for nominations is Friday, December 14, 2018. Kindly complete and submit the 2018 Faculty Awards of Education Nomination Form.